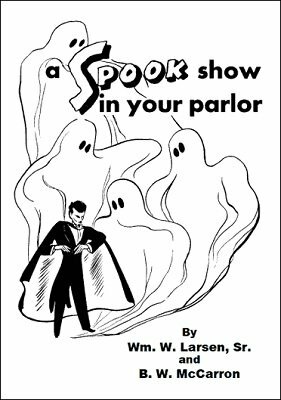 Host your own entertaining séance or year-round haunted house with these frightfully spooky stunts. Not just for Halloween, you'll be the life of the party any time with more than a devil's dozen effects and stunts that take place around the séance table or darkened room. They won't break the (blood) bank, either. Newly revised, with over 20 pages of added content, including new methods, attractions and ideas to make yours the most talked-about event in your city or town. Don't just perform magic . . . live it in your own house of spooks and ghosts. A great compliment to the Ghost Book of Dark Secrets and Theatre of Blood , this updated book of "blackout" secrets is a must-have addition to your spook magic library. 1st edition 1947, PDF 32 pages.